Sergey Kyznetsov was born on the 20-th of May, 1959 in the Altai region, graduated the Moscow Higher Art and industrial School ( the former was named - the Stroganov School) in 1984. He is Member of the Union of Painters of Russia and the internationa Federation UNESCO. Participand of the personal and international exhibitions in Russia and abroad. His works can be found in private collections in Russia, Australia, England, Germany, China, Mongolia, United States, France. 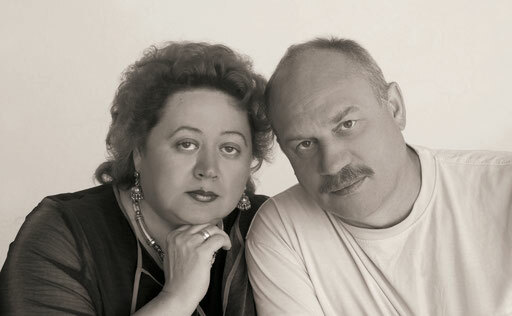 Nadezhda Leonova - Kuznetsova is an artist too. She is Sergey's inspiress, friend and assistant. Nadezhda was born in the Far East, attended the same Moscow Higher Art and industrial School, as Sergey did, and graduated it in 1984. Nadezhda is member of the Union of Painters of Russia and the international Federation UNESCO.